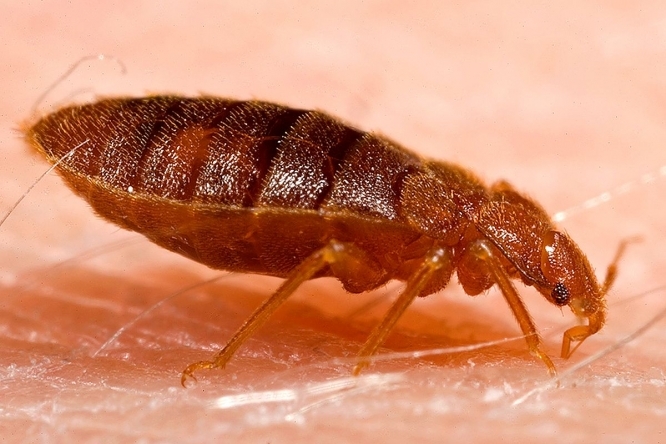 Bedbugs live and lay eggs in mattresses, sheets, and other bedding, and can cause red, painful bites, as well as severe allergic reactions including fever and blisters - although they are not known to be carriers of any illness. Visible to the human eye - but still just a couple of millimetres wide - they are infamously difficult to get rid of, can spread quickly, and can travel on human skin. Often, the easiest way to get rid of them is to simply throw away the mattresses concerned, and disinfect or throw away all towels, sheets, and bed frames, before replacing with new ones.